This article looks at the role of existing government policies on perceptions of risk and the impact they have on developing forward-looking sustainable policy instruments. 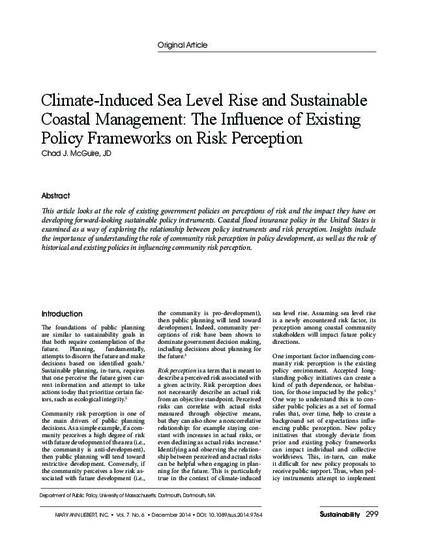 Coastal flood insurance policy in the United States is examined as a way of exploring the relationship between policy instruments and risk perception. Insights include the importance of understanding the role of community risk perception in policy development, as well as the role of historical and existing policies in influencing community risk perception. This is a copy of an article published in Sustainability: The Journal of Record © 2014 [copyright Mary Ann Liebert, Inc.]; Sustainability is available online at: http://online.liebertpub.com.